This morning three of us Tucsonans, Sue, Kim and I drove up I-10 to our State Capitol to help the Phoenix type folks unwelcome Bush as he came in to Mesa to visit the military contractors at visit to the company was probably only arranged so he could use Air Force One toSilverado Cable Company — this come to Phoenix forMcCain fund raising events. A couple hundred folks gathered on S. Dobson Road at 1st Avenue. The crowd was quite diverse and included Phoenix CODEPINK, local folks, young and old people, folks from Flagstaff — first time protestors and seasoned professionals. It was difficult for me to get a picture of the lineup of a couple hundred people along the street as I couldn’t get into the street or across the street due to the police presence. Met up with Arizona Liz (here shown with Kim & the “Balls” sign.) Liz has been a busy little pinker in D.C. representing our state with other CODEPINK women from around the country. I’ve written about her being assaulted when Desiree managed to let Condi know that the blood of scores of thousands is on her hands. 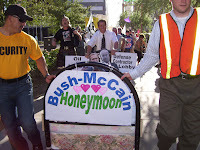 Overall this was a good event with lots of people venting at the motorcade as it drove by so as to let Bush and Co. know that he isn’t welcome here by regular folks and McCain is not being supported by most folks in Arizona now either. Liz walked out into the street with a huge sign that said “Pray for Insane McCane” as the motorcade was passing by on its way to the fundraiser that had been moved to an undisclosed location after they couldn’t sell enough tickets to have the event at a large arena. I hear it was also because of the protests to some degree. The most disconcerting thing that happened was a cop with major camera apparatus who was filming every one in the crowd. When one young woman asked if that was going to get her on a list, the cop put his camera down and came over and got in her face and yelled, “What did you say to me?” She was quite taken aback and obviously a bit frightened. First, why are cops taking pics of people lawfully gathered together to send a message to the administration. Secondly, why did he have to act like and A**hole? Unfortunately my pic of him taking a pic of me turned out blurry. I’m putting it up any way. 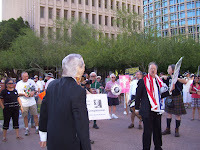 Then is was on to Cesar Chavez Plaza in downtown Phoenix to Pink Slip Bush. I don’t have any pics of that as I was one of the women who had to physically drag Bush away from the adoring cadre of Billionaires for Bush to that we could Pink Slip him. You can see his back and one of the Billionaires in the pick I snapped as we were getting ready to grab him. 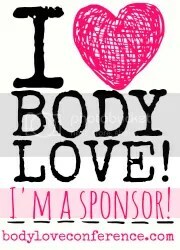 I will have pics of that sent to me tomorrow and I hope to have them up tomorrow evening. 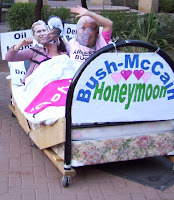 McCain that was of course followed by a honeymoon in whichAfter that there was a marriage ceremony for Bush and it was clear that McCain is in bed with Bush as they were escorted in their bed through the streets of downtown Phoenix. 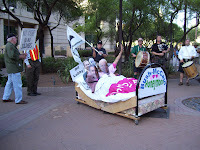 Then it was on to grab a bite to eat at Rosie’s (10th and Camelback) to refuel and hear a few words from Rae , CODEPINK ‘s national liason with local groups. There were Gilbert folks there who were PDA affiliated, and folks from various other groups affiliated with the Phx End the War Coalition. After that we then decided on the way to where we were crashing, that we would stop by and chat with Blair and his buddies who are all associated with 9/11 Truth. Bryce is fasting for the next few weeks to bring attention to our nation’s “Hunger for Truth.” If you go to this site you can find out about it. It is always good to connect with other groups who want the same end result as you even if you differ on the details and issues. The next post I will talk more about why all this was happening.